Delaware 2 constitutes a heavily traveled arterial across northern New Castle County. The state route follows Old Capitol Trail / Kirkwood Highway east from Newark to Elsmere and the couplet of Union and Lincoln Streets to Little Italy in Wilmington. Designated by the Delaware Highway Department in 1936,1 the route formerly extended west through Newark to the Maryland state line. SR 2 was realigned to bypass Downtown Newark in 1988. The state route previously followed Elkton Road northeast from Christina Parkway to the one-way pair of Delaware Avenue east and Main Street west. The couplet passes through areas of the University of Delaware campus and the heart of the Newark business district. With on-street parking, several pedestrian crossings and an S-curve by Newark High School, routine congestion occurred along the route. The new alignment took the state route east from Elkton Road via overlaps with SR 4 and 896 along Christina Parkway and Chestnut Hill Road and north to Capitol Trail along SR 72 (Library Avenue). The change was made to divert some of the through traffic off Main Street and Delaware Avenue through Downtown. SR 2 Business was posted in its place. Additional changes were made in the city of Newark by fall 2013. SR 2 was truncated east from the Maryland state line to the intersection of Library Avenue (SR 72) and East Main Street (SR 273) by College Square Shopping Center. SR 2 Business was decommissioned entirely, while Elkton Road west of Christina Parkway (SR 4) was renumbered as SR 279 to match Maryland 279 in Cecil County. 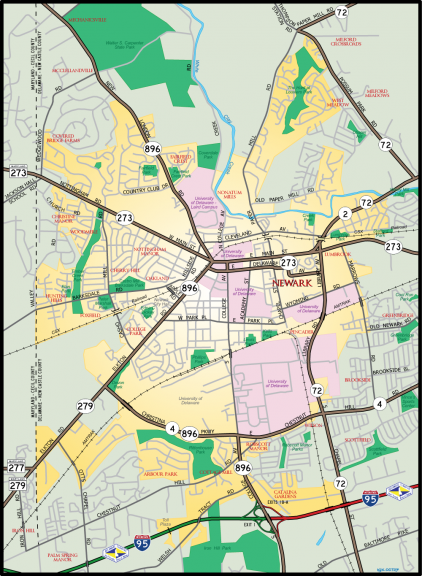 The renumbering of SR 2 and SR 2 Business in 2013 removed several overlaps in an effort to simplify the route system across Newark. Delaware 2 runs concurrent with Delaware 72 east to Possum Park Road outside the Newark city limits. SR 72 turns north there to Milford Crossroads and the Upper Pike Creek Valley as SR 2 transitions into a commercial arterial, Kirkwood Highway, east to Elsmere. The Capitol Trail bypass was finished in 1941. It was renamed by the Delaware General Assembly that year to honor Robert Kirkwood (1756-91), a native of Newark and officer in the American Revolution. The Kirkwood Highway name referenced only the new alignment for Capitol Trail. The 5.84 mile bypass portion ran from Pike Creek Road to the east end of New Road in Elsmere, where Route 2 transitioned to South Union Street in Wilmington. The remainder of Route 2 west from Pike Creek Road retained the name Capitol Trail.1 The highway was widened to the city of Newark by 1949. Kirkwood Highway is used synonymously with Capitol Trail in the Newark vicinity by locals and in street addressing today. Almost all of the Kirkwood Highway frontage is developed with strip malls, retail shopping centers, residential subdivisions and apartment complexes. Polly Drummond Hill Road, Upper Pike Creek Road, Milltown Road, Delaware 7 (Limestone Road), and Duncan Road provide north-south routes from the arterial into the Pike Creek Valley suburbs. Western reaches of Kirkwood Highway undulate over a series of hills associated with the edge of the Appalachian Piedmont. A short stretch along White Clay Creek State Park reveals the former natural beauty of the area as SR 2 trudges east as a busy commuter route to Meadowbrook. Kirkwood Highway expands into six lanes from St. James Church Road east to Prices Corner. The added capacity serves big box stores and other retail centered around the busy intersection with SR 7 (Limestone Road) near Marshallton. East of Duncan Road, SR 2 crosses Red Clay Creek on a 1940-built bridge that was expanded to six lanes in 1988. Delaware 41 (Newport Gap Pike) ties into Kirkwood Highway from Hockessin to the north at Prices Corner. Prior to 2015, the state route overlapped with Delaware 2 for a half mile east to the Newport Freeway (Delaware 141). The concurrency provided continuity between Newport Gap Pike and Delaware 141 south to I-95 and New Castle. SR 41 previously ended at the southbound on-ramp from SR 2 (Kirkwood Highway) to SR 141 at Prices Corner. The end point was created in 1979, when the Newport Freeway was completed, and SR 41 dropped from its overlap with SR 141 south to New Castle. The exchange with SR 141 was constructed in 1972 to replace an at-grade intersection with Centerville Road (old SR 141). SR 141 follows the Newport Freeway south to Interstates 95 and 295 and Centre Road north to Greenville and Fairfax. Continuing east from Prices Corner, Delaware 2 (Kirkwood Highway) enters the town of Elsmere and narrows to four lanes. Speed limits reduce to 35 miles per hour, and historically Elsmere garnered attention as a speed trap town. An improvement project through Elsmere during the early 2000s redesigned a portion of Kirkwood Highway into a landscaped boulevard with new planters, sidewalks, decorative signal mast arms and other landscaping. Kirkwood Highway shifts Delaware 2 south from its original alignment along New Road, between Sanders Road and Rodman Road, through east Elsmere. New Road is discontinuous due to a CSX Railroad line while Delaware 2 passes over the tracks along a four-lane span east of Delaware 100 (Dupont Road). The original overpass was constructed in 1949. It was expanded to four lanes in 1985. Delaware 2 enters the city of Wilmington at Canby Park as Kirkwood Highway ends. There the state route partitions into the one-way couplet of Lincoln Street (eastbound) and Union Street (westbound). Lincoln Street carries two lanes northeast to the Bayard Square and Little Italy neighborhoods to the state route end at Delaware 52 (Pennsylvania Avenue). Paralleling one block to the north, Union Street accommodates three lanes of traffic by the Flats and Union Park Gardens communities to Canby Park. Delaware 2 shield assemblies posted along Otts Chapel Road north ahead of Elkton Road in Newark. These markers were taken down in 2014 when Elkton Road was renumbered as Delaware 279. Photo taken 05/15/05. Polly Drummond Hill Road descends from suburban areas of Drummond Hill through White Clay Creek State Park ahead of the intersection with Delaware 2 (Kirkwood Highway) and Red Mill Road. Photo taken 06/25/10. Harmony Road provides a popular link from Interstate 95 and Delaware 273 north to Delaware 2 (Kirkwood Highway) and Pike Creek Valley. Pictured here is the approach to Kirkwood Highway on Harmony Road north. Photo taken 09/27/14. Delaware 2 (Kirkwood Highway) heads west from Harmony Road to Polly Drummond Hill Road and Newark. The arterial east lowers to cross Pike Creek ahead of the Meadowood community. Photo taken 09/27/14. A span wire array with Eagle Flatback signals remained in service at Harmony Road and SR 2 until 2010. Photo taken 06/26/10. SR 2 trailblazer posted ahead of Delaware Park Drive on Old Capitol Trail west. Delaware Park Drive links the western segment of Old Capitol Trail with SR 2 (Kirkwood Highway). Photo taken 12/20/16. Delaware Park Drive connects Kirkwood Highway with Old Capitol Trail west to the Eastburn Heights and Eastburn Acres subdivisions and the north entrance to Delaware Park Racetrack and Casino. Photo taken 12/20/16. This junction assembly for SR 2 on Delaware Park Drive north was removed by 2015. Photo taken 05/01/05. A pair of shields direct motorists to Delaware 2 at the end of Delaware Park Drive. Kirkwood Highway leads west to Meadowood and Newark and east to Prices Corner. Photo taken 12/20/16. Farrand Drive links the eastern segment of Old Capitol Trail with Delaware 2 (Kirkwood Highway) at Marshallton. Photo taken 01/14/17. Farrand Drive intersects Delaware 2 (Kirkwood Highway) at a commercialized intersection between Gordy Plaza and Farrand Center. Photo taken 01/14/17. Farrand Drive extends north across Kirkwood Highway to the Kirkwood Gardens community. SR 2 west meets SR 7 (Limestone Road) just to the west. Photo taken 01/14/17. Approaching Delaware 2 (Kirkwood Highway) on Duncan Road south near Prices Corner. Duncan Road leads south from McKennans Church Road and Delcastle Park toward Old Capitol Trail (Old Delaware 2). Photo taken 07/31/04. Duncan Road intersects Kirkwood Highway just west of Red Clay Creek. South of Delaware 2, Duncan Road ends at Greenbank Road opposite Newport Road in Marshallton. Photo taken 07/31/04. Newport Road heads north from Old Capitol Trail and Marshallton to connect with Duncan and Greenbank Roads north to Delaware 2 (Kirkwood Highway). Photo taken 12/23/17. Francis, William. (2014) Images of America - Along the Kirkwood Highway. Charleston, South Carolina: Arcadia Publishing. 05/15/05 by AARoads and Lou Corsaro.